Cats of various colors and have specific symbolism, with the blessings on their coins chosen to match. The color correspondences come from the Chinese Feng Shui tradition: gold for wealth, white for creativity, black to ward off evil, green for home and family, blue for mental abilities, pink for relationships, yellow for health, purple for prosperity, and red for just about anything. At a time when the capitol was plagued by intrigue, there was a loyal courtier who did his best to go about his honest business and fulfill his duties to the emperor. One day, he was summoned to the offices of a certain nobleman. On his way there, he noticed a cat that seemed to be beckoning to him. Curious, he turned off the road to go and see what the cat wanted, stopping for a moment to scratch its ears. Some noise made him turn back toward the road, and he noticed that he had been about to walk into a trap that the evil nobleman had set to kill him; had he not stepped off the path, he would have been killed. The wise courtier saw that the cat had saved him–and probably saved the emperor too, by revealing the nobleman’s treachery. 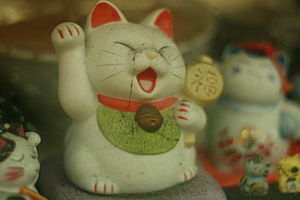 So he ordered the first Maneki Neko statue to be made, and it brought him luck for the rest of his life. Love the Lucky Cat !!!!!!!! Paw up ! Kids…. Thanks, Donald! I’ve fixed it.